"Your satisfaction is our #1 priority". We offer best customer service and lifetime free technical support. Any questions please feel free to send us an email, our customer service and technical team will be with you shortly Quick and Easy Set Up Compare with the traditional camera, Zebora IP camera just need 3 steps to set up. 1. Download "Yoosee" app from App store/Play store or the website. Also you can scan the QR code from the manual or the package box. 2. Register an account and then log in. Make sure your phone is connected with Wi-Fi. 3. Power on your camera, wait for seconds until you hear the voice of "start configuration". Click "Smartlink" in "+" menu, and then input your Wi-Fi password. Once the camera is connected with Wi-Fi, the Cam ID pops up automatically, then you just input the default camera password. Now you are ready to start monitor and control the camera wherever you are. Specifications: Resolution: HD 1280 x 720 (720P) Lens pixel: 1.0 megapixel Focal Length: f=3.6mm Lens view angle: 69° Pan/Tilt Angle: 355°/120° Night vision distance: 40ft Audio input/output: Two-way audio, built in micro speaker in camera. Memory: Supports up to 64GB TF card (SD HC card) Motion Detection: Alert on your phone, capture picture and send to your email. 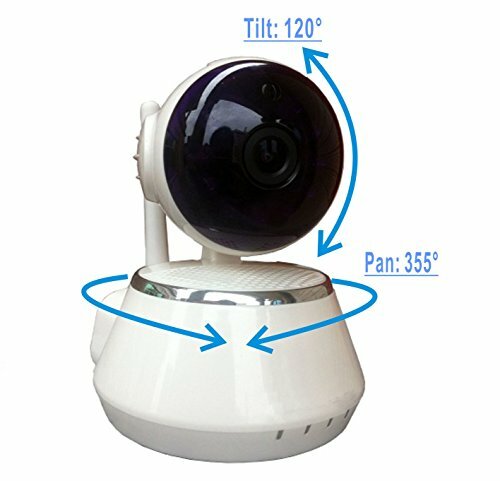 Working temperature: -20 ~ 60° For Optimal Use Most of electronic product, including this IP/wireless camera support 2.4 GHz network only. Most of home Wi-Fi is 2.4GHz Network. 5.0 GHz network is rare, but if your Wi-Fi is 5.0 GHz-based, please contact the carrier, and check your router to see if possible to change to 2.4 GHz.